Occasionally, it is inconvenient or impossible to assay the drug in plasma, but it may be possible to follow the appearance of the drug in urine. If the drug is not metabolized to any appreciable degree, the pharmacokinetic model may be written as shown in Scheme 1. A plot of cumulative amount of drug appearing in urine (Du) versus time will be the mirror image of a plot of amount of drug remaining in the body (DB) versus time. 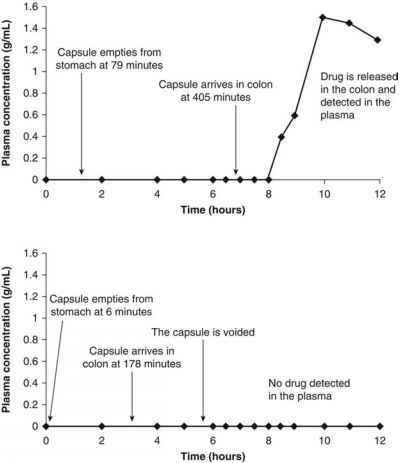 This is illustrated in Figure 5, which shows that the total amount of drug recovered in urine throughout the entire study (D1) is equal to the dose (DB) and, at any time, the sum of drug in the body (DB) plus drug in urine (Du) equals the dose (DB). Figure 5 Plot of cumulative amount of drug in urine, DU (solid line), and amount of drug in body, DB (dashed line), versus time according to Scheme 1. Equation (17) is in the form of an equation for a straight line (y = mx + b), where t is one variable (x), -kel is determined from the slope (m), ln D^ is the constant (b), and ln (D1 - Du) the other variable (y). 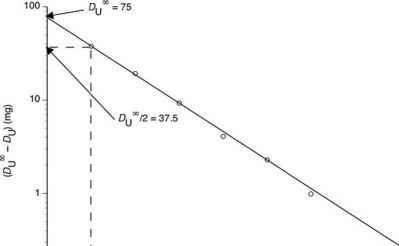 Thus a plot of ln (D^ - Du) versus time is a straight line with a slope providing a value of kel and an intercept of ln D^. Since D^ is the total amount excreted and Du is the amount excreted up to time t, D^ - Du is the amount remaining to be excreted (ARE). A typical ARE plot is shown in Figure 6. Example. The plot in Figure 6 was constructed using the data shown in Table 3. Note that the concentration of the drug in each urine specimen is not the information analyzed. The total amount excreted over each time interval and throughout the entire study must be determined. As a result, the experimental details of a urinary excretion study must be very carefully chosen, and strict adherence to the protocol is required. Loss of a single urine specimen, or even an unknown part of a urine specimen, makes construction of an ARE plot impossible. 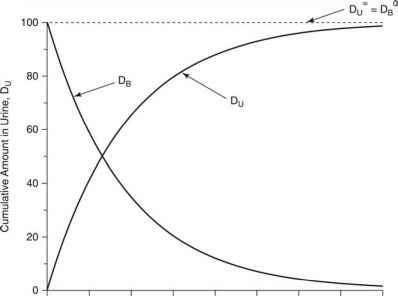 Figure 6 Semilogarithmic plot of drug ARE into urine, D1 — Dn, versus time. Abbreviation: ARE, amount remaining to be excreted.